Today on National Doctor’s Day, Senior Express wishes all dedicated and passionate doctors a very happy Doctor’s Day as they are the one who are spending an essential amount of their time and energy in the promotion of our health and wellbeing. 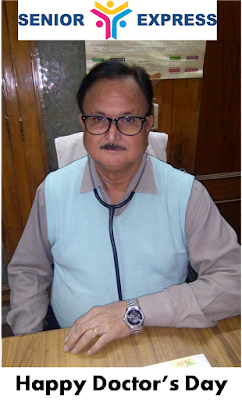 On this occasion we would like to thank our active contributor Dr. Ashok Mishra, a 69+ General Physician (MBBS Doctor) from Allahabad. For him his medical practice is not only a profession but also a means to do welfare service towards the disadvantaged section of the society. He has been treating patients since 1975 and for him his profession is an essential part of his life which keeps him physically, mentally and spiritually active. We salute him and other doctors like him who are dedicating their time and energy in the development of the society.